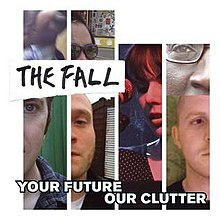 Your Future Our Clutter is an album by the Fall, released in the UK on 26 April 2010. It is the group's twenty-seventh studio album, and their first for independent record label Domino. The album was recorded at The Chairworks, Castleford and Elevator Studios, Liverpool. Publicity for the record describes it as the group's "most rampant, most forward moving, bone shaking best." The album had previously been referred to as Our Future Your Clutter. As with the group's preceding album, 2008's Imperial Wax Solvent, the line-up consists of Mark E. Smith (vocals), the group's chief songwriter and only constant member, as well as his wife Eleni Poulou (keyboards and vocals), Dave "The Eagle" Spurr (bass), Peter Greenway (guitar) and Keiron Melling (drums). The album was produced by Ross Orton, Mark E. Smith, and Simon "Ding" Archer, who produced three songs. Your Future Our Clutter entered the UK Album charts at number No. 38. "Bury Pts. 1 + 3" peaked at No. 94 in France. The album has received favourable reviews, with New Yorker music critic Sasha Frere-Jones calling it one of the best albums of the year. "Cowboy George" contains an uncredited sample of Daft Punk's "Harder, Better, Faster, Stronger", which is heard briefly fading in and out during the intro. The double vinyl version comes on 180g heavyweight vinyl with two exclusive, non-CD tracks: "986 Generator" and "Get a Summer Song Goin'" and features a re-ordered track list. It does not come in a gatefold sleeve. ^ "Your Future Our Clutter by The Fall". Retrieved 19 September 2016. ^ "AllMusicGuide Review". AllMusicGuide. allmusic.com. 4 May 2010 Accessed 5 May 2010. ^ "One Thirty BPM review". ^ "New Album – The Fall – Your Future Our Clutter – 26th April". Domino Records. Dominorecordo.com. 18 February 2010. Accessed 18 February 2010. ^ Frere-Jones, Sasha. "S/FJ: BEST OF 2010". Sashafrerejones.com. 20 November 2009. Accessed 16 November 2010. ^ "The Fall's 'Cowboy George' - Discover the Sample Source". WhoSampled. Retrieved 26 November 2017. "EXCLUSIVE INTERVIEW with The Fall's Elena Poulou". La Bouche, issue 3. October 2009. This page was last edited on 24 October 2018, at 16:18 (UTC).